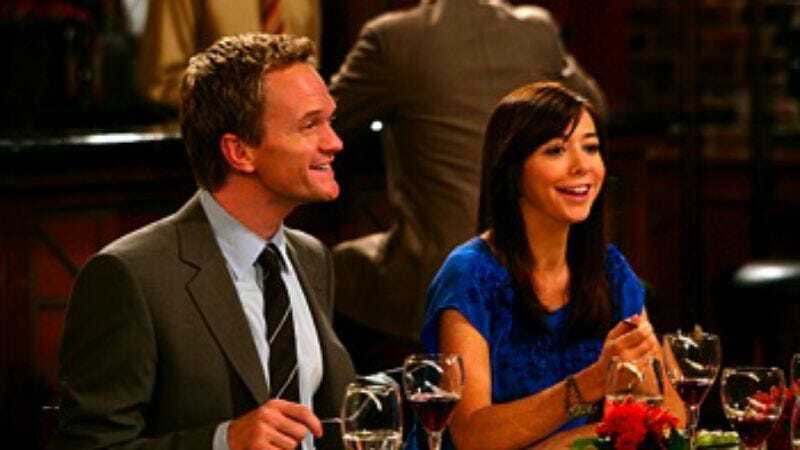 How I Met Your Mother: "Intervention"
In this week's Popless, Noel writes about whether experimentation is better than conventionality. It's a discussion that's applicable to our sitcom blogs here at the TV Club. Every once in a while one of the non-believers will come wandering into our comment section and express disbelief that we're acting like a laugh-track three-camera half-hour comedy has anything going for it. And while they tend to get shouted down on this page, the same isn't true if they place that sentiment elsewhere on the site — even elsewhere in the TV Club. For some people, once the cresting wave of television passed the traditional sitcom by, there was no point in creating anything new in that genre. It's as if people were still trying to pretend silent movies are a viable medium. But Noel contends that there's something to be said for solid work within the old conventions, especially if the alternative is an avant-garde that doesn't keep itself grounded in the basics of the form. And if that's so, then there's surely much merit in appreciating and honoring those old conventions while transgressing their boundaries to grow a new varietal in that old soil. Isn't that what's happening with tonight's episode, "Intervention"? It's not a laugh-out-loud entry in the series, so those looking for instant gratification might turn away too quickly. It doesn't wear its style on its sleeve, so those looking for innovation might not see anything new. But look again, and it's all about subtle plays on the form, wrapped in the familiar sitcom package. Suddenly, everyone in the group is moving away. Marshall and Lily are finally going to their new apartment, the Slanty Shanty. Robin's moving to Japan to take that network correspondent job. Ted's moving in with Stella in New Jersey. And Barney — well, he's not going anywhere per se, but his perverse effort to bag a chick using old man makeup does fit the theme of change. As the group reminisces about all the damage they've done to their apartment, their stories begin to cluster around a period in which they were holding regular interventions: to get Marshall to take off his Dr. Seuss hat ("I do not like that stupid hat/I want to beat it with a bat"), to stop Lily from speaking in a terrible fake lower-class British accent, to wean Robin off spray tanning ("they reel you in with a coupon and then you're hooked!"). And although the "INTERVENTION" banner was destroyed by Barney's flaming magic tricks during the Barney-magic-tricks intervention, Ted finds a new one boxed up with a sheaf of letters, and realizes that the group had been planning a non-stupid intervention to help him realize that he shouldn't marry Stella. (It couldn't be a stupid one, because they decided not to do anymore stupid interventions during their intervention intervention.) Embracing his cold feet, Ted begins unpacking all the ridiculous man-crap that he and Marshall accumulated during their years in the apartment: the flail from the Ren-fest ("there's not enough mead in the world to make me get rid of my flail"), the sombrero, R2-Sweet-Tooth the robot cookie jar ("my sensors indicate that your pecan sandies levels are dangerously low"). 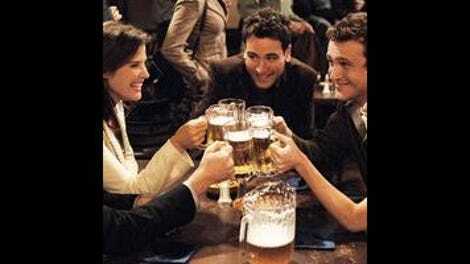 Marshall joins him, Lily calls their new place a black hole of death, and Robin abandons the idea of going to Japan. At this point, the conventional sitcom is in full swing: Nothing ever changes. And Ted celebrates stasis with a rousing "Who wants to go down to our same old bar, sit in our regular booth, and order the usual?!" But the sight of Barney in 83-year-old mode macking on a sweet young thing changes Ted's mind. Nope — they're all going to move on. Because you can't stop time. They're going to get old, and they need to get on with their real lives so they won't end up pretending to be kids, getting more and more pathetic. Ted proclaims the day a holiday, and calls upon the youth of McClaren's to gather from their disparate locales at that same booth in one year to drink the most expensive hooch in the place ($2500 Scotch) and celebrate their independence. And so they do. Except … they still have the apartment upstairs. Did anyone move on, or not? And if not, what are they celebrating? Is there a goat waiting for them up there? Nothing changed, then everything changed, and then — we don't know. HIMYM wants to keep us off balance. Its rhythms are only half comfy slipper and stress-relieving belly-laugh. The other half is like those shoes with the convex soles that you wear to improve your gait. It's sitcom exercise, a little workout for a genre that everybody assumes has gone soft. If you're with the program, folks, then you're already reaping the benefits. - I love this episode, even though it's not one of those you could show to a non-believer to get them to understand what's special about the show. It's an insider episode — all the effortless timing and invention that makes the show great, but just for us. Not for them. - You'd think Neil Patrick Harris in old man makeup would be a cringe-inducing gimmick, but not the way NPH sells the bit. The hand-tremble, folks. Repulsion at the 31-year-old. The epilogue: "What about the old sandpit?" Something that would have gotten tired in act one of a lesser show keeps on giving right until the final shot. Classy. - How about the ultra-Canadian drunk Robin bit? Here's what really makes it go: They're not even pretending that this is anything but the broadest, crassest, sloppiest set of Canadian stereotypes. When Robin drops the gloves in preparation for the Lily catfight, I was cheering for fake Canuckery. Great misdirection on that scene, too — it's not Robin's slap shot that marred the wall by the door, but Barney's frustration at being denied girl-on-girl violence. - "That's douchee, not douch-ay."